Banana plant or plantain plant not only gives the delicious fruit but it also provides textile fiber, the banana fiber. 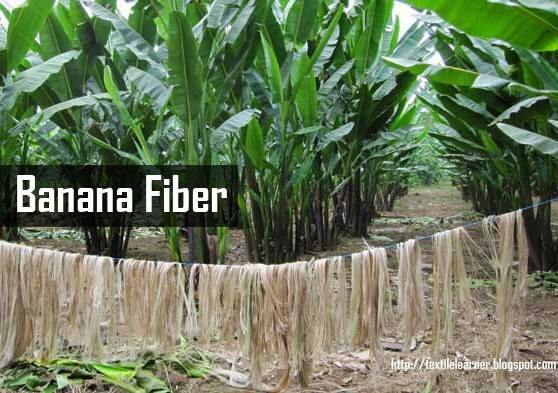 Banana fiber is natural fiber. Natural fibers present important advantages such as low density, appropriate stiffness and mechanical properties and high disposability and renewability. Moreover, they are recyclable and biodegradable. There has been lot of research on use of natural fibers in reinforcements. Banana fiber, a ligno-cellulosic fiber, obtained from the pseudo-stem of banana plant (Musa sepientum), is a bast fiber with relatively good mechanical properties. Banana plant is a large perennial herb with leaf sheaths that form pseudo stem. Its height can be 10-40 feet (3.0-12.2 meters) surrounding with 8-12 large leaves. The leaves are up to 9 feet long and 2 feet wide (2.7 meters and 0.61 meter). Banana plant is available throughout Thailand and Southeast Asian, India, Bangladesh, Indonesia, Malaysia, Philippines, Hawaii, and some Pacific islands. Fig: Banana plant or plantain plant. Banana fiber has its own physical and chemical characteristics and many other properties that make it a fine quality fiber. Appearance of banana fiber is similar to that of bamboo fiber and ramie fiber, but its fineness and spinnability is better than the two. The chemical composition of banana fiber is cellulose, hemicellulose, and lignin. It is highly strong fiber. It has strong moisture absorption quality. It absorbs as well as releases moisture very fast. It is bio- degradable and has no negative effect on environment and thus can be categorized as eco-friendly fiber. Its average fineness is 2400Nm. It can be spun through almost all the methods of spinning including ring spinning, open-end spinning, bast fiber spinning, and semi-worsted spinning among others. Fig: Extraction of Banana Fiber from bark of Banana plant. The extraction of the natural fiber from the plant required certain care to avoid damage. In the present experiments, initially the banana plant sections were cut from the main stem of the plant and then rolled lightly to remove the excess moisture. Impurities in the rolled fibers such as pigments, broken fibers, coating of cellulose etc. were removed manually by means of comb, and then the fibers were cleaned and dried. This mechanical and manual extraction of banana fibers was tedious, time consuming, and caused damage to the fiber. Consequently, this type of technique cannot be recommended for industrial application. A special machine was designed and developed for the extraction of banana fibers in a mechanically automated manner. It consisted mainly of two horizontal beams whereby a carriage with an attached and specially designed comb, could move back and forth. The fiber extraction using this technique could be performed simply by placing a cleaned part of the banana stem on the fixed platform of the machine, and clamped at the ends by jaws. This eliminated relative movement of the stem and avoided premature breakage of the fibers. This was followed by cleaning and drying of the fibers in a chamber at 200 C for three hours. These fibers were then labeled and ready for lamination process. After fiber is collected, the process goes to yarn spinning. The researcher investigated the traditional process, which use the filament yarns in weaving banana fabric. The finding showed that the convention process was very time-consuming, thus not appropriate for today’s use. Therefore, this research explored open-ended spinning process for yarn development. The fiber was cut in to 3-centimeter length for spinning process. After yarn spinning, weaving is done in the looms as per normal process like any other material. Fig: Spun yarn, weaving and Banana fabric. Fig: Uses of Banana fibers. In the recent past, banana fiber had a very limited application and was primarily used for making items like ropes, mats, and some other composite materials. With the increasing environmental awareness and growing importance of eco-friendly fabrics, banana fiber has also been recognized for all its good qualities and now its application is increasing in other fields too such as apparel garments and home furnishings. However, in Japan, it is being used for making traditional dresses like kimono, and kamishimo since the Edo period (1600-1868). Due to its being lightweight and comfortable to wear, it is still preferred by people there as summer wear. Banana fiber is also used to make fine cushion covers, Necties, bags, table cloths, curtains etc. Rugs made from banana silk yarn fibers are also very popular world over.